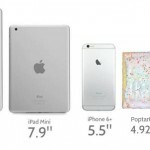 iDevice size spectrum, with Pop-Tart for reference. Instapaper’s new(ish) InstaRank feature on iOS is really helpful for picking out what to read next. It lets me find what’s popular now from among the articles in my reading list and lets me filter my list based on the amount of time I have to read. Is this a deceptive or just poorly worded error message? Also the ‘Visit Website’ link is broken. I’m pretty sure there’s some way to get Twitter working on my phone. The other apps at the bottom of the page work just fine. 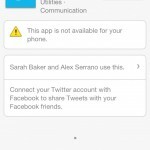 Twitter and Facebook don’t have to play nice together, but if Facebook is going to show Twitter in its App Store, it should probably just let Twitter tell its users if if works on my phone or not. Getting into the habit of telling your users what your competitors are capable of is often bound to make you look like you don’t know what you’re talking about. I Forgot My Phone – YouTube: Written by/Starring Charlene deGuzman and directed by Miles Crawford. This video shows me. And probably lots of us. Far too often, I find myself absorbed in the action of a 4-inch screen instead of seeing the real world unfolding around me. I’m not going to throw the phone away or retire it when my contract is up, but this video has inspired me to try to put it away when there are others around. The girl in the video is visibly frustrated when her friends are paying attention to their phones instead of to her, but there is no evidence that she is more interesting than what her friends are looking at. The first step to fixing this problem it to put the phone away. The second is to surround yourself with people more interesting than your phone (and to be more interesting than your friends’ phones). There is a time and a place for reading and exploring the universe from a tiny screen and a time to find it in its physical form. Occasionally forgetting my phone at home will help. Tumblr, excellent work with the new version of your iOS app. I, and many others I’m sure, appreciate the Markdown support and the new iPad version. Siri, Take This Down: Will Voice Control Shape Our Writing? Yes. Yes it will. And, likely, it will be a good thing for communication. In the case of voice-to-text technologies, however, all writing becomes a kind of rehearsal for verbal interaction. In this light, an important effect of computerized dictation technologies is that they could lead people to become more skillful speakers, and thus more thoughtful participants in meaningful discussions. If writers of the future are composing text almost exclusively through computerized dictation, then they may become more thoughtful and nuanced speakers in the process. Posted in BlogTagged Apple, dictation, iPhone, siri, software, voice to textLeave a Comment on Siri, Take This Down: Will Voice Control Shape Our Writing? The definitive review. I can’t wait to get my hands on one. I am severely tempted to buy an iPhone just to try this app that recreates the sensation of being chased by Zombies. Apparently, you are less likely to slow down or stop if there is a risk of your brains being eaten. Posted in BlogTagged app, fitness, iPhone, running, zombiesLeave a Comment on ZOMBIES, RUN!